Many older adults recognize the fact that staying physically active is key to a better quality of life. However, it seems like the older we get, the more difficult it becomes to incorporate exercise in our daily routines. You might feel hindered by chronic arthritis or lower back pain that make it challenging to move about freely. Or, your busy lifestyle may keep you from finding time to exercise regularly. Maybe the thought of joining a gym is far too intimidating. Sometimes, it seems like you can come up with a variety of reasons to simply just enjoy a sedentary lifestyle. However, the more active you are in your later years, the higher quality of life you’ll enjoy. Regular exercise is key in preserving your mobility and independence. In fact, adding physical activity to your routine can help reduce some of those chronic aches and pains that may be stopping you in the first place. Exercise has a variety of other benefits, too. You maintain better heart health, your bones stay stronger and your flexibility improves, all of which lower your risk for injury. Additionally, exercise has benefits on your mental and emotional health, too. It’s a known mood-booster that can even improve your memory and cognition. Decrease the risk for falls. Exercise can help you remain steady on your feet, as it helps you build muscle strength and flexibility. Since falls are the leading cause of fatal and nonfatal injuries in seniors, with 1 out of 3 adults age 65 or older falling each year, exercising is key to avoiding an injury. Better manage chronic conditions. Regular movement helps lubricate the joints and decrease that chronic pain and stiffness you feel. Exercise is crucial for managing and reducing pain from conditions like arthritis, plus, it can help reduce the risk for heart disease, cognitive impairment, diabetes and stroke. Eliminate some medications. A combination of aerobic activity, strength training and flexibility exercises can reduce the need for some medications. For example, when you’re physically active, endorphins can increase and improve your mood, lessening the need for medications to reduce symptoms of depression. Plus, exercise can help reduce systolic blood pressure and decrease your need for blood pressure medication. Improve your sleeping habits. If you have trouble sleeping or suffer from insomnia, being physically active during the day can help you enjoy more restful sleep at night. It makes sense, because when you’re more active throughout the day, you tend to be more tired in the evening. However, avoid strenuous activity two hours before bedtime, and instead opt to work out in the morning or early afternoon. Find your new favorite activity, no matter your ability. 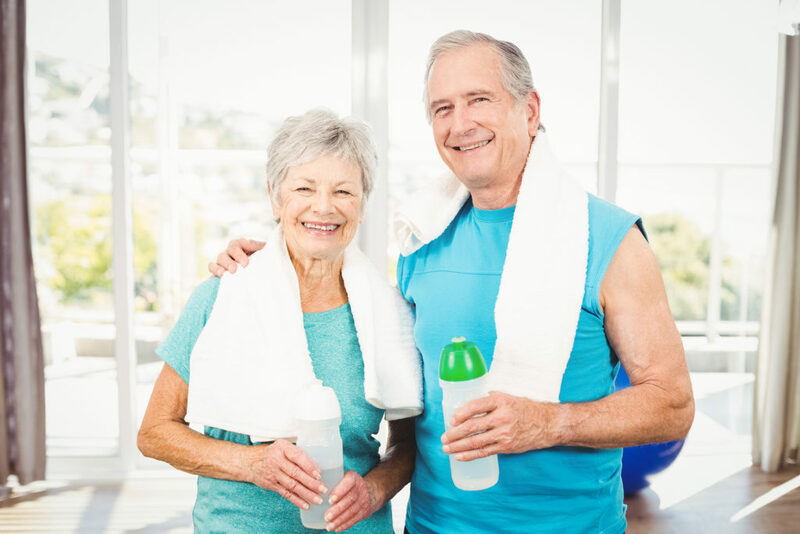 No matter what your current fitness levels are, you can find senior fitness programs and exercises that will meet your individual needs. If you need a low impact workout that is easier on your joints, try swimming. It works every muscle group in the body while giving your joints a break. Or, if you’re just getting started in a senior fitness program or have mobility issues, chair exercises can get you started building muscle tone and increasing blood circulation. The key is to find an activity you look forward to so you can start experiencing the benefits of exercise right away. At Immanuel Lutheran Communities, we focus on all six dimensions of wellness through a variety of healthy activities for residents. You’ll find senior fitness classes designed with your needs in mind. Try a strength, balance and fitness class or improve your flexibility in a yoga class. Contact us to learn more about the living options offered at our Kalispell retirement community located in the beautiful Flathead Valley.